So I was in Recently Played and played a song. When I clicked on the album art it always went back to All Songs. Same for Most Played, Recently Added, or any playlists. The 'Recently' lists might be special cases in that they are dynamic lists, but regular Playlists certainly should not behave that way, tapping on the title should take you to the song in context within the Playlist view. @maxmp , this is one for the to-do list I suspect. Hello! Can you please change two visual things in the latest beta? First of all, is next and previous icons in notification tray and lockscreen. There are Fast forward and rewind buttons instead of next and previous. (reference) Here is the example of Poweramp and telegram's player attached. Secondary, when we minimize current song we should press current playing bar on the bottom of the screen to go back. Please add and option to go back by taping the same songs name again, at least optionally. Currently taping playing song again starts the same song from the beginning. I second that. I have reported the same in a previous beta version of PA. It's much easier to tap the same song than tap the current playing bar at the bottom as its size is much smaller. It's much easier to tap the same song than tap the current playing bar at the bottom as its size is much smaller. I have to say I agree. As there is no longer a seekbar displayed in the Library view, I can't see the point in a song restarting when you tap on its currently-playing title in the list. 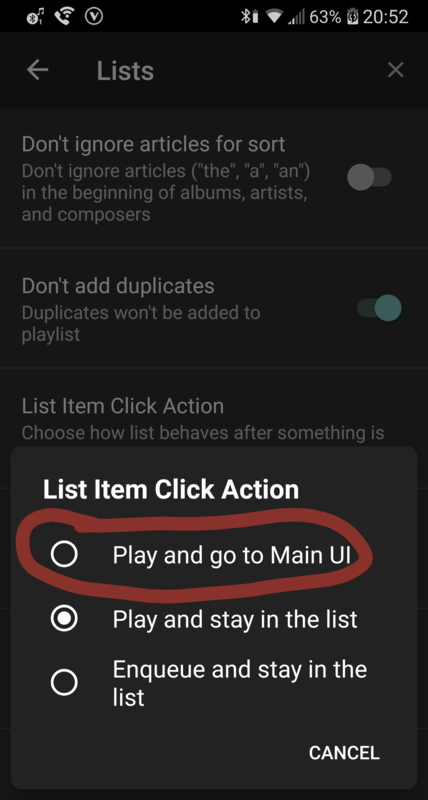 I have for a long time wanted this action to not restart playback, as that would make a great way to change the playback category 'on the fly' (e.g. from All Songs to Album or Artist) without interrupting the music. That's exactly what the Recently Added library category should do (assuming you have ﻿Sort by Filesystem Date/Time enabled). How about adding a dynamic option in the USB DAC output sample rate？Setting output sample rate due to different music files might hlep avoiding resampling, which might reduce outp﻿ut quality a bit. Now I can only set it to a fixed rate. That's one of the long pending requests, once v3 steady is out and all bugs are ironed. You can find it in another thread. Using mate 20 pro, and Hi-res output works well now!!!!!!!!!!!!!!!!!!!!!!! @Noetsi Wow! 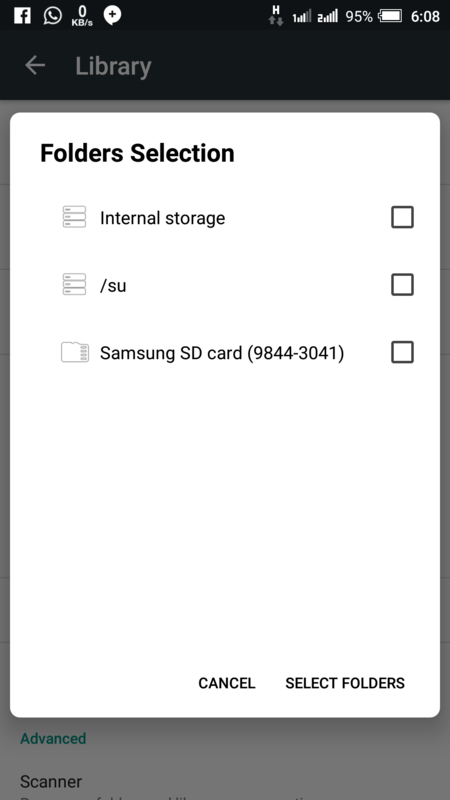 I noticed the exact same issue yesterday (Build 807, Galaxy Note 9) and I was about to report it. But it seems to have fixed itself and I can't reproduce it. OK, it's b-a-a-a-c-k! This is Build 809, Galaxy Note 9. I am actually playing In A Glass House by Gentle Giant as displayed in main area, but PA is showing (Wanna Get To Know You) That Good! by Shania Twain as the current song in the bottom area. As PA plays through the tracks in the playing album, it displays an entirely different, apparently random song in the "now playing" bottom area. If I long-press the "now playing" song title, PA does correctly bring me back to the correct playing album. I can even change albums and play them, but the "now playing" song is some random thing. I do not know exactly how I get this situation to happen in the first place. However, once it's happening, this might be a clue... If I do a song search and then tap that song to play it, the "now playing" song will be correct. I.e. if I tap the song's image to bring up the category list (all songs), the "now playing" song is correct. I can tap other songs in that category and they will display the correct "now playing" song. Yet, if I play a song from a playlist, the "now playing" song will now be wrong again. problem with choosing folders for music and unticking the video ones..
Option keeps on diapering and coming back... It's something that needs to fixed asap.. Check that you have got PA set for it to startup in the player screen rather than the Library. Also, you can just use the Home button to exit rather than Back. I have a problem with the latest version + Poweramp v3 skin blue light, on my car stereo Android when I restart the car it loses the covers of some songs. Moreover this does not keep the order of the songs, they are often mixed. What do you mean by latest version, you are posting this in an old thread for build 807, whereas 814 is current and 815 is imminent.